Let it snow, let it snow, let’s go Cubs….? 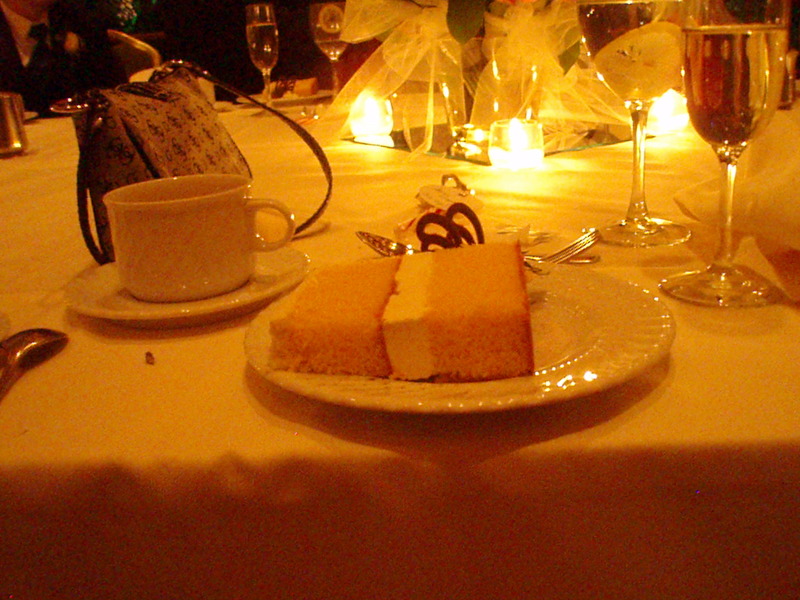 Operation Wedding has come to a close (at least for now)… The original wedding cake that I had known about since the creation of this blog is now complete. It was one crazy, jam-packed, freezing weekend in Chicago, but amazing and completely worth it, and an experience I’ll never forget! Being entirely too ambitious and optimistic, I had thought we’d finish baking and decorating on Thursday. However…. Of course, I hadn’t taken into account transporting, actual appliances available, and the Hyatt kitchen staff hours, more to come on that in a bit. So, Thursday morning, we woke up to a fresh layer of snow and treacherous roads. Our champion and groom, Chris, drove out to the Hyatt where we were staying (and also where the reception was planned for) to pick us up and bring us to Karen’s Mum’s house to bake. Once there, we set to work. “We” being myself, Amy and Caroline, two amazing cake ladies who know how to gitt’er done! 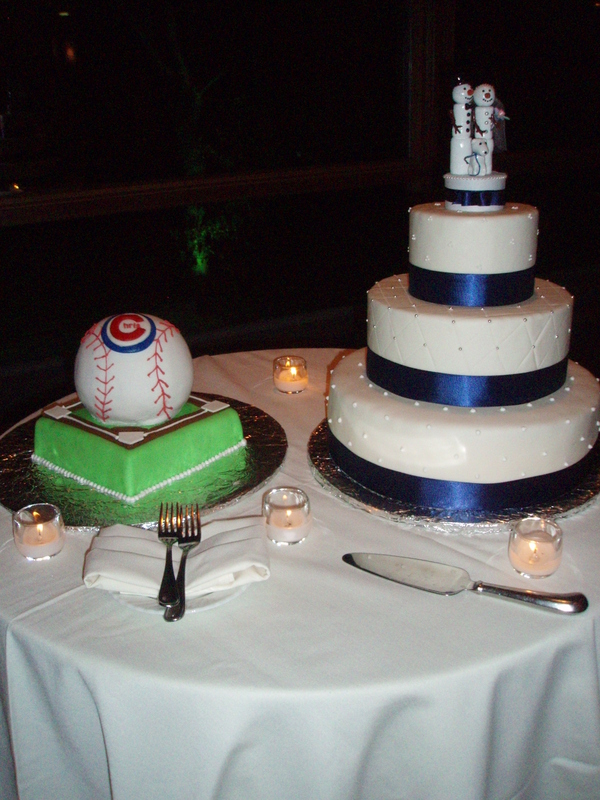 Anyways, the plan was for the bottom tier of a three tier wedding cake (14″ diameter and two layers plus buttercream filling), and a Cubs baseball and some sort of base. Amy was a mastermind at this, because she brought this nifty sphere pan for the baseball, and we were literally improvising with whatever we could find at Karen’s. 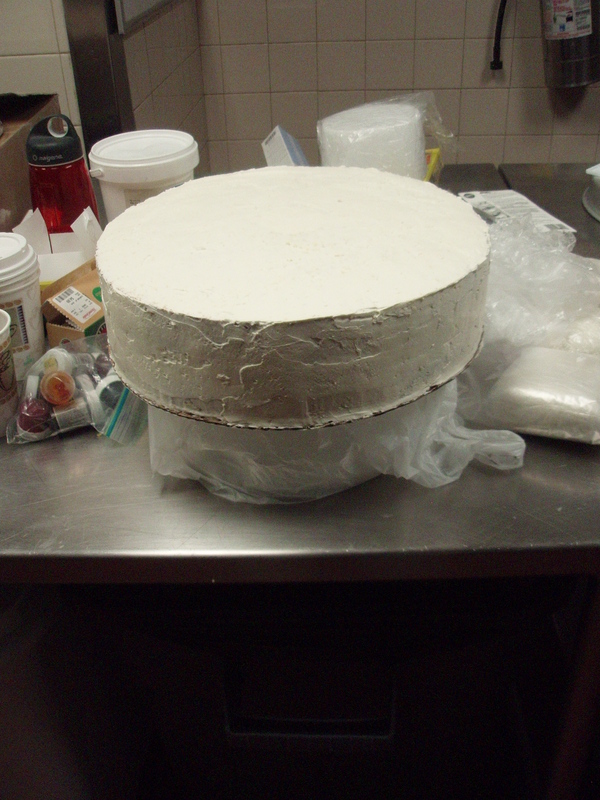 The original plan for the giant Cubs cupcake didn’t come to fruition. 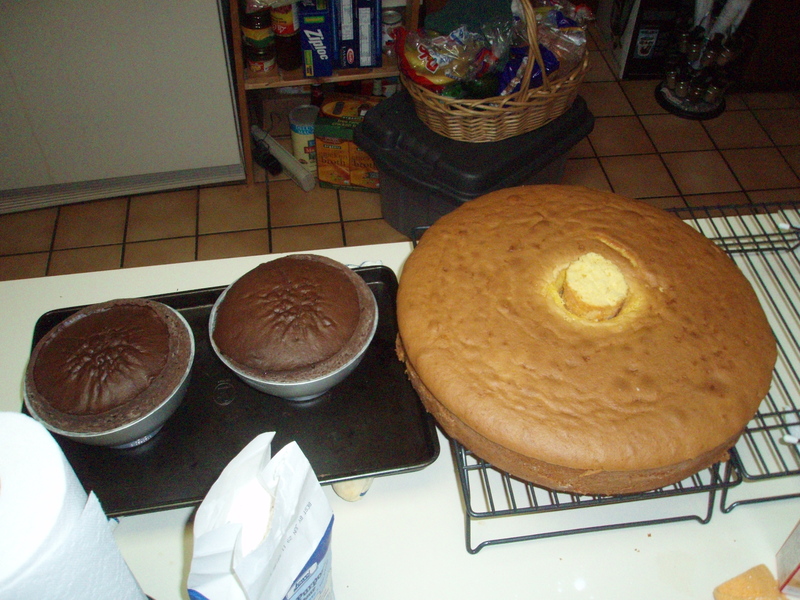 The two hemispheres (chocolate) and the 14″ layer with baking core. 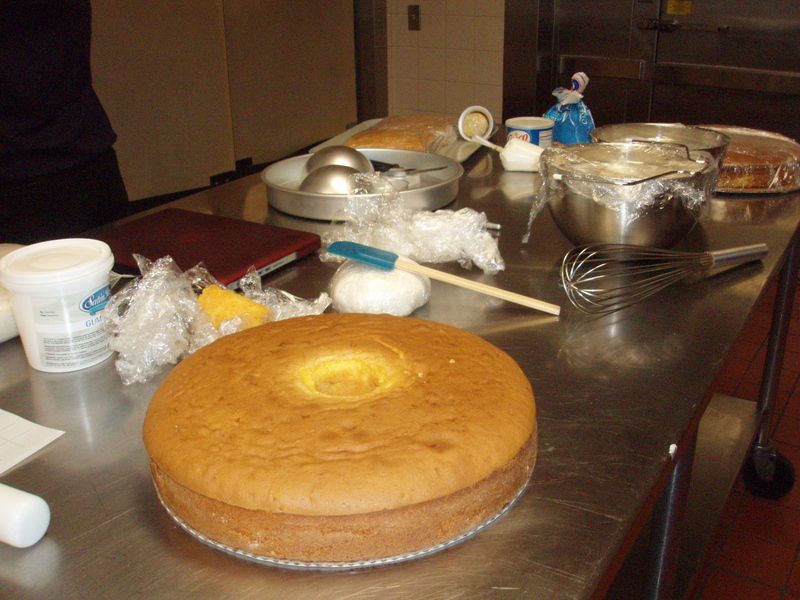 Blurb on the “baking core”- the hole in the middle of the 14″ circle: When a pan is 10″ or larger in diameter, a baking core is recommended to help even baking, so you don’t have burnt edges and an undercooked middle. It’s basically a piece of cone shaped metal that sits in the middle of the pan, drawing heat towards the middle so it radiates evenly along the pan. 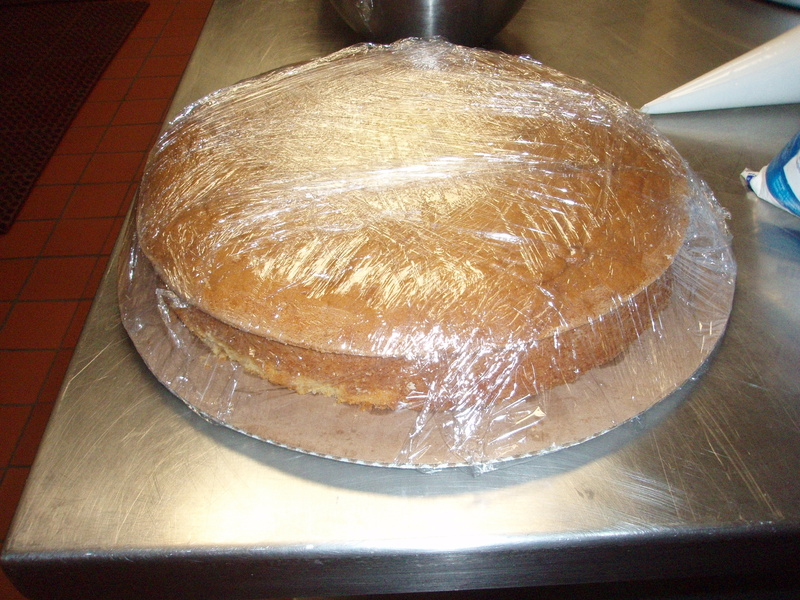 You fill it with some batter, so whatever hole it leaves, you just pop out the piece and fill it in! 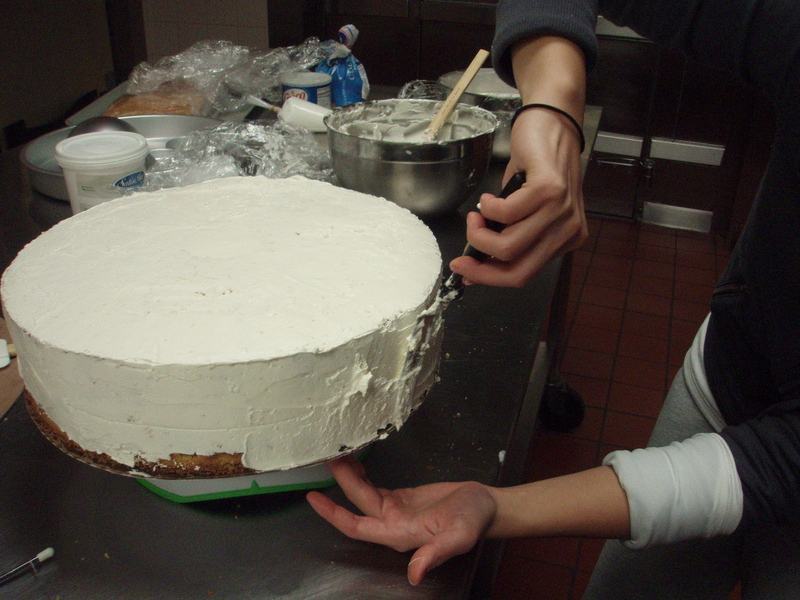 No one can tell in a frosted cake. 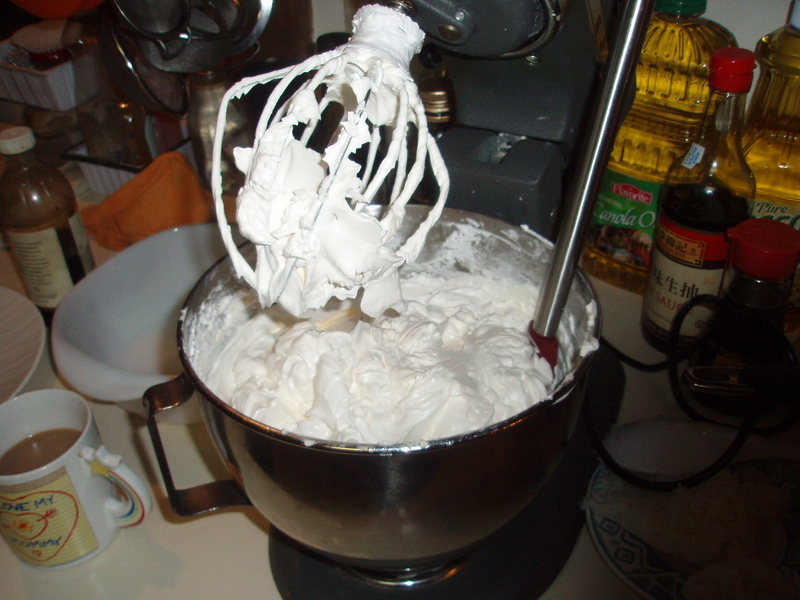 Back to the kitchen… I tripled my normal buttercream recipe below: 9 egg whites, 1.5 c. sugar, 0.75 c. corn syrup, and… dun dun dunnnn… 7.5 sticks of butter :), unsalted. I think I gave Caroline a heart attack when she saw me cuttin’ those puppies up. But realistically, it feeds 75+ people. Do the math, it’s not that bad for you! Next… a packing job my dad would be proud of! To transport these guys back to the hotel where we’d be doing the decorating, we used tons of saran wrap, just like on Food Network :). And also how my dad packs his products to be shipped. We had an elaborate discussion on packaging before I left home for Chicago. . . so here’s my tribute to it! 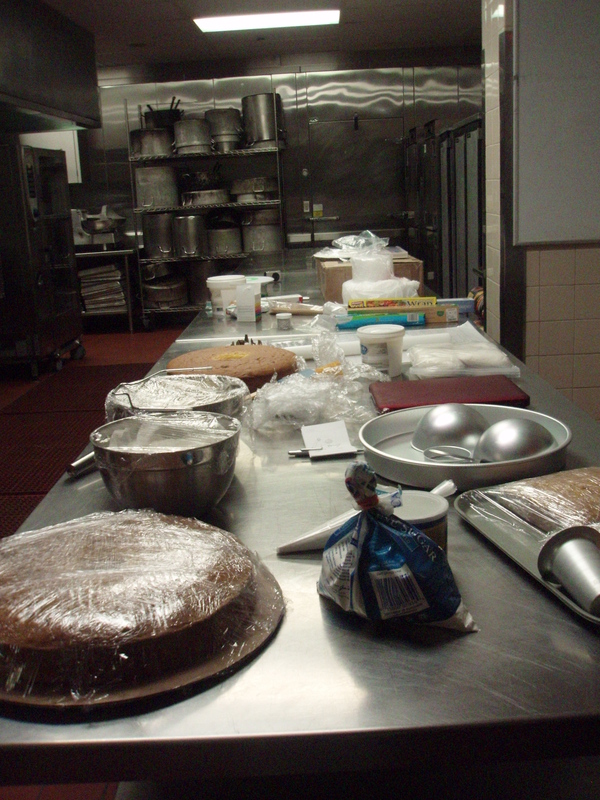 Now, the coolest experience ever- being in a commercial sized kitchen with enough decorating space for everything! Loved it, it was awesome, thank you Hyatt at McDonald’s campus! 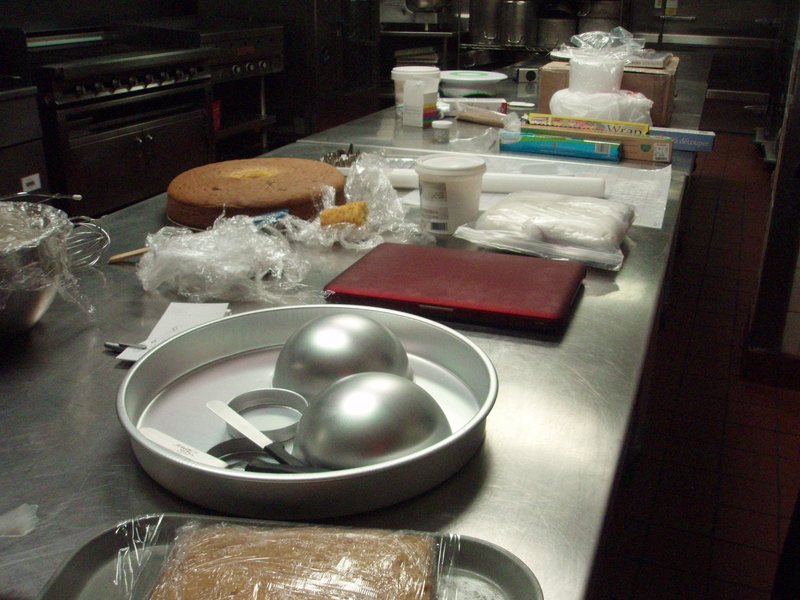 Next: Prepping the cake- buttercream frosting, etc. 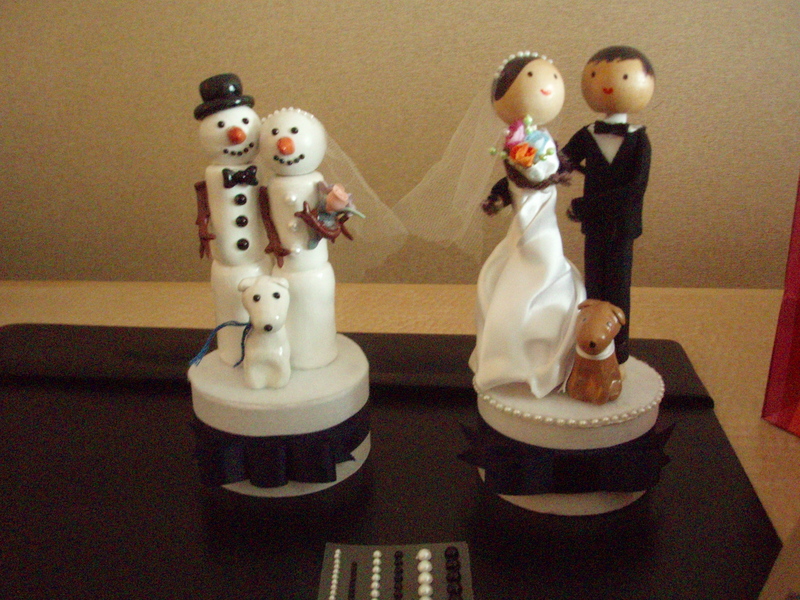 I’m now skipping to the final product… I lacked some in-between detail photos. . .These were the two cake toppers I had made before arriving… I originally made the one on the right first, but revised to match the winter snowman theme preferred. So the one on the left was the winner! 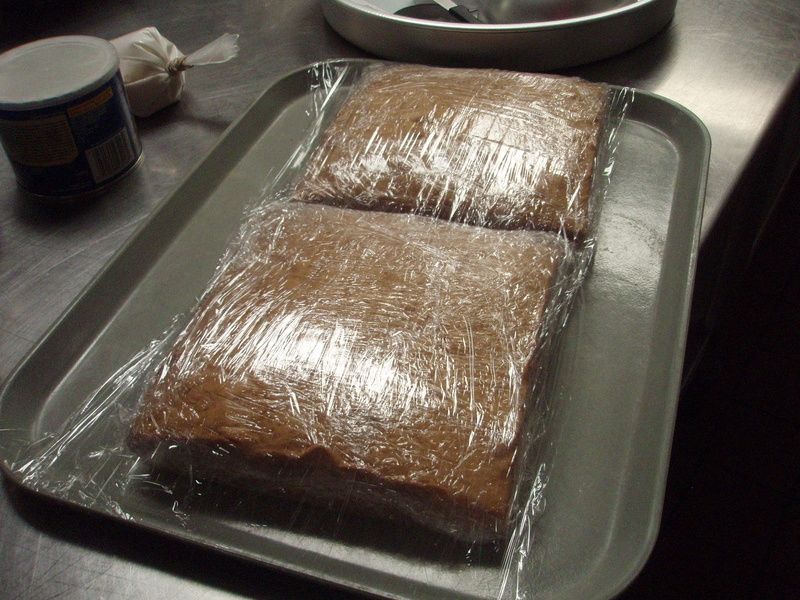 Finally, the Cakes! Grooms on the left, Bride’s on the right. Chris wanted a Cubs logo, that was pretty much his only criteria. So, we tweaked it and piped “Chris” to personalize it. 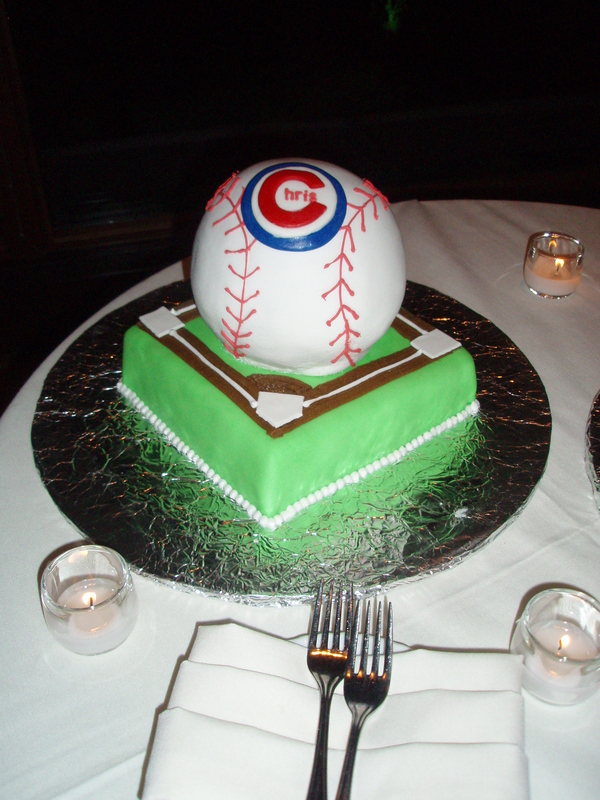 The girls did a wonderful job coloring the fondant to reach “Cubs” blue. My contribution was the red “C” and the letter piping. We made a great team with all of our skill sets! Amy’s meticulous piping on the top of the cake made for a great baseball diamond 🙂 And Caroline’s arms contributed to coloring the fondant that bright and cheery “Wicked” green.It took all 3 of us to cover that sphere in fondant though. 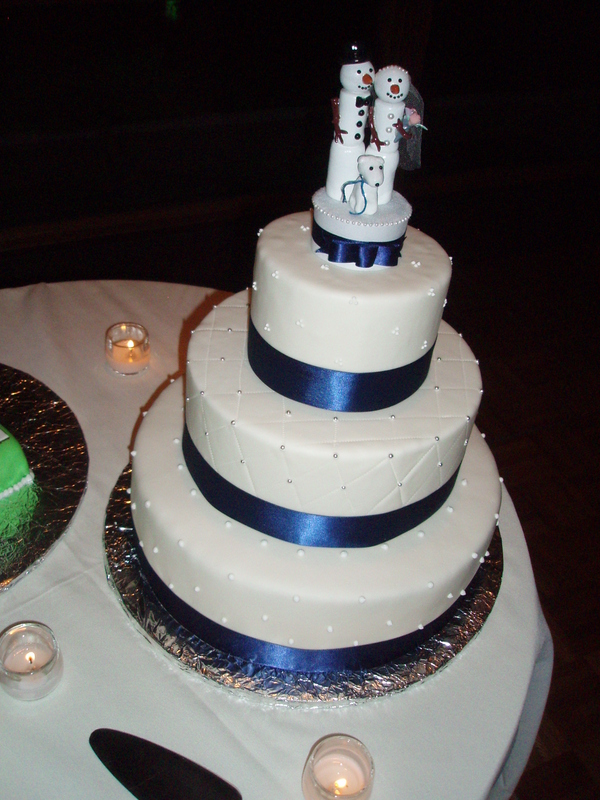 The Bride’s cake was definitely a bit easier. 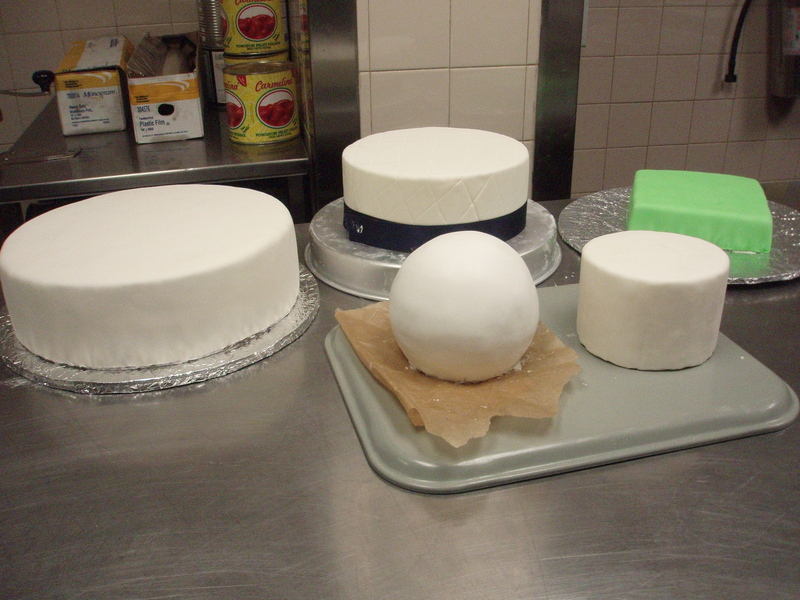 I used white royal icing to pipe the triple dot pattern on the top layer and the single dot pattern on the bottom layer. The middle was just the quilted pattern with silver dragees. Lastly, the hotel cut and plated it, so it looked like a real dessert!